This book is the first detailed study on Pancakrosi and its associated inner sanctum, the Antargrha Yatra. Assuming itself as the centre of the cosmos, Kasi (Varanasi, Banaras) has preserved up to date its mandalic system, which is experienced and revived by millions of devout Hindus through pilgrimage. 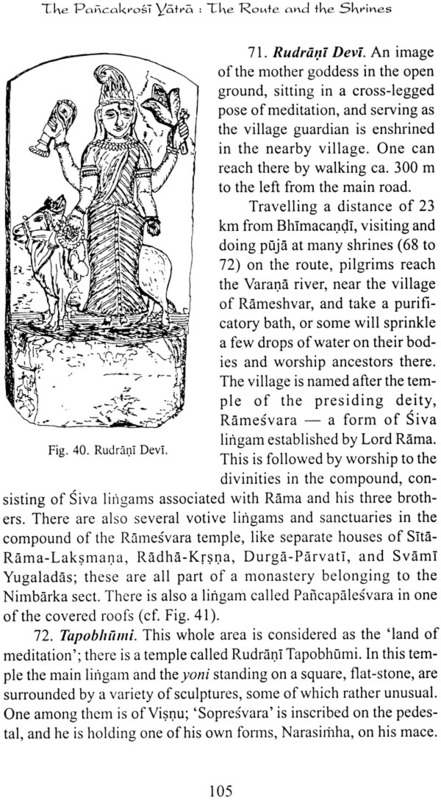 At least since the 15th century, devotees continuously perform pilgrimage on these two circuits. The oral and mythological traditions of pilgrimage are narrated with a combination of historical, experiential, cultural, statistical, spatial and Indological perspectives. The 108 shrines on the route are described with the help of many maps and illustrations. The topic covered include the background of the archetypal nature of pilgrimage, the cosmic mandalas and the circulatory paths, the historical background of the Pancakrosi Yatra and its contextual growth, the context of cardinality, the impact of change, the pilgrimage- cognitive maps, sacred territory and sacred time, religious experiences, the Pancakfrosi temple, the Dharmasalas, the characteristics of pilgrims, the circuit of the inner sanctum, the ecology of place and the Improvement Plan. Finally, the book includes an exhaustive bibliography, followed by appendices giving information on shrine, temples, yatras, etc. The author, Rana P.B Singh, is a geographer at the Banaras Hindu University, Varanasi and Founding President of the Society of Heritage Planning & Environmental Health, and also of the Society of Pilgrimage Studies. He has a deep personal experience of these sacred journeys since the last two decades as a devout Hindu, a pilgrimage organizer, a guide of religious tours and a wanderer. To understand the wholeness of the cosmos man has developed a sense of its divine manifestation over the earth, and pilgrimage is accepted of its divine manifestation over the earth, and pilgrimage is accepted as the symbol of a cosmic journey. Places of pilgrimage are special areas possessing extraordinary powers of religio-magnetism. This characteristic is still invoked by contemporary Hindus. By journeying to these places pilgrims obtain its 'fruit' (phala) which transform their life, give inner satisfaction and also purification and peace - so the pilgrims express it. The Pancakrosi Yatra delineates the contemporary outermost sacred territory of kasi. It is performed every year and attended by thousands of pilgrims. The study of sacred geography reveals several dimensions of understanding the deep cultural structure, experiential feeling and geomantic landscape of Varanasi. City which in the ancient past was assumed to be the centre of the cosmos, axis mundi, perceived and reflected in different contexts. In India, the Pancakrosi Yatra is the only such territory where all the textual shrines are still in existence and devotees pay visits to them on auspicious occasions as purificatory rites. The fully developed mythology with respect to this sacred territory is narrated in a 16th century text, the kasi Rahasya. Taking this text as a base, the sacred route, the landscape and the pilgrims' involvement are narrated so as to understand the overall nature amalgam of culture and landscape, where faith and belief are the prime consideration, there emerge a new environment, a theosphere to be interpreted in a better way in the frame of totality and as a faithscape. All my life I have felt close to place speaks. A place talks. A place communicates. A place is a growing organism, a form of being. A place is an interrelated community, playing between man and cosmos. The presence of place was real to me long before I knew anything of the energies by which it works. Since my childhood I have sensed 'something' in and around a place. The visible and invisible message have been a sources of real meaning to my life. I have moved from one place to another. However, I carried with me the memories and mythic sentiments attached to the place. I don't know how and why this sense has always been with me. Somehow, later in life, I learned that place attachment is a human quest for understanding and also a feeling- the immanence and transcendence of a force linking Man and Cosmos. I first became aware of the sensitivity I 've just described during the early 1970s, when I was doing fieldwork for my doctoral dissertation. In the late 70s my inner quest mobilised my sight and vision for reading the genius loci of a place or landscape, ultimately trying to interpret and understand the meaning, messages and milieus preserved there. Further, on that march, I don't know when I became a traveler, a wanderer, who always carried the familiarity and ordinary while moving in search of much more powerful settings, scenes, and saredscapes. While walking on this road, people from different parts of the world joined me and made our group a company of seekers, a mosaic of culture, thought and vision. The latest member who joined us is my own son Pravin. This book is a humble attempt to present the vivid and unique experiences, the cultural tradition and history and also the aspects of the complex structure of cosmogony associated with the Panckrosi Yatra and its circular-route. It is assumed that the landscape geometry together with interlinking alignments and multi- layered structure makes the web more complex. This helps to regulate its functioning simpler and easy. This book is the extension of the author's earlier publications on various aspects of the Pancakrosi Yatra (Singh, 1987, 1991, 1998, 2000, 2002).